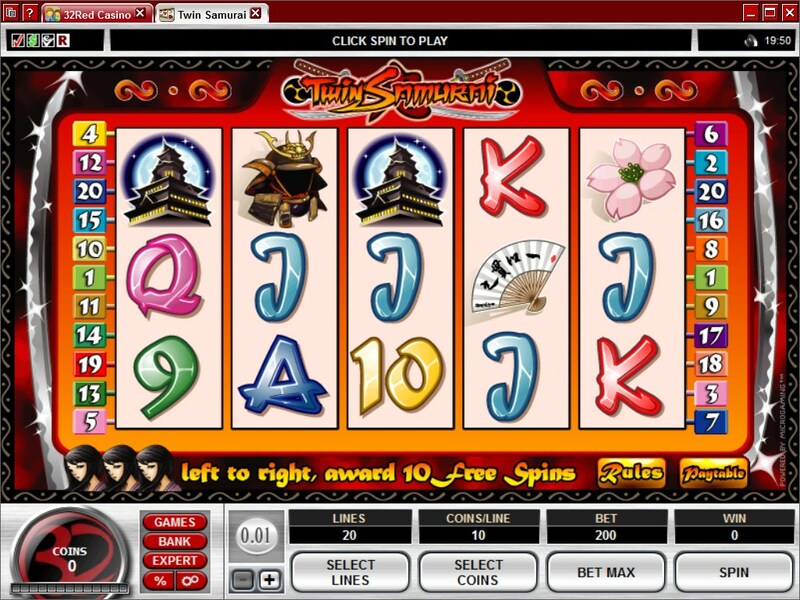 Twin Samurai is a game from Microgaming, whose inspiration seems to come from Japan’s samurai, the proud warriors that acted as the nobility of the country during the Medieval Ages. Though the Japanese inspiration is the one that you’re going to notice for the most part, there are playing cards as well, but overall I think that they did a decent job in this area and they’re above the competition. Though there aren’t a lot of slots with the same theme, some do exist. You can expect to count up to 20 paylines that are active each round in this 5 reel game. 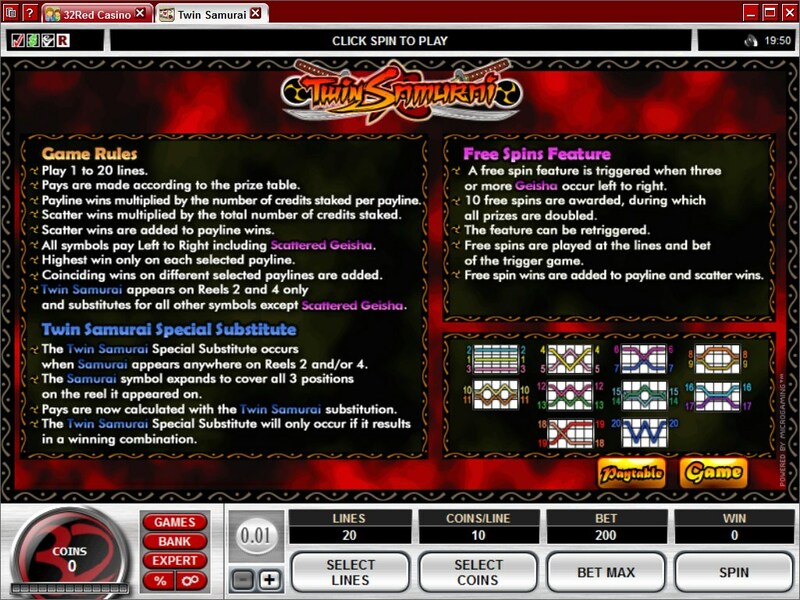 Twin Samurai offers you access to scatter symbols, to expanding wilds and free spins with 2x multipliers. A $25,000 top jackpot is advertised on the paytable. The game uses wilds to trigger bonus games, offers free spins and multipliers with the scatter’s help, and overall it seems like it is capable of offering a decent experience. The Twin Samurai symbol does show you two people fighting, but you can’t tell from the image if they’re really twins. This wild symbol appears only on the 2nd and the 4th reels, but despite this limitation it can be very useful, as it expands and covers the entire reel. It’s a regular wild otherwise, capable of substituting for the other symbols, as long as they don’t have scatter abilities. The expanding quality does come in handy, but the wild can’t offer cash prizes directly any longer, since it doesn’t appear on all the reels. 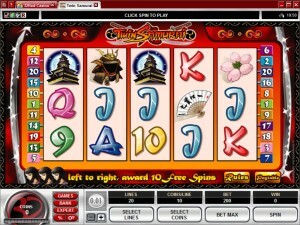 The Geisha, a very common choice for a symbol in Asian inspired slots, will act as the scatter feature of Twin Samurai. Since it’s the scatter, it will appear anywhere on the reels and will offer prizes based on the number of appearing symbols and on the bet used that round. There is also the requirement that scatters appear from left to right, so they can be anywhere on the reels, but the reels have to be neighbors. Prizes for two to five Geishas vary between 2x and 100x the round’s bet. 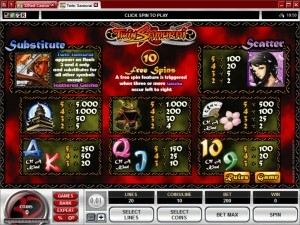 The slot has free spins to give you, a classic feature by now that most modern slots have. 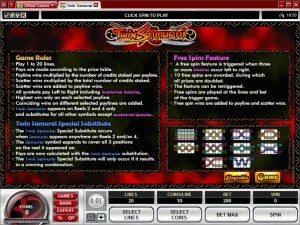 The requirement is typical as well, with 3+ Geishas being sufficient to give you 10 free spins. The scattered Geishas need to go from left to right, on neighboring reels, but don’t need to be on certain lines. Prizes are doubled for the duration of the free spins and you can retrigger this feature. You can spend as little as $0.01 to get the game started, but for the bigger payouts you will have to get closer to the $100 maximum bet. That kind of wager can be formed by using coins of $0.25 instead of the $0.01 minimum, plus you can select up to 20 coins per line. You get a line bet of up to $5 this way. The game has a jackpot which gives you 5,000 times the line bet investment. With $5 being the top line bet, you can get up to $25,000 from the main prize. The Anime style that is visible in the way the characters were drawn is a good choice for a slot that is inspired by Japanese warriors. About half of the symbols get this treatment and they are based on Japanese castles, helmets and lotus flowers, while the other half are playing cards which claim to be drawn in an Asian style that doesn’t manage to be convincing. The game looks great though, even with the playing cards present, and the background image has a lot to do with that assessment. Symbols: Twin Samurai (wild), Geisha (100x the triggering bet, scatter), Castle (5,000x), Samurai Helmet (1,000x), Hand Fan (500x), Lotus Flower (500x), Ace (250x), King (250x), Queen (150x), Jack (150x), 10 (100x) & 9 (100x). I’ve enjoyed playing the game, mostly because of the theme choice, but also because of the expanding wilds and the free spins. In most ways it’s a very common type of game though, so don’t expect an out of the ordinary experience from it. 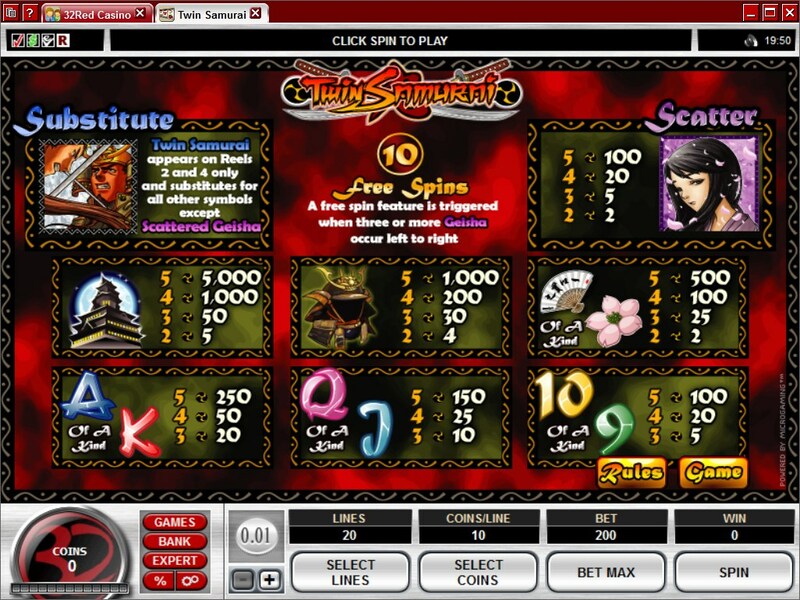 Twin Samurai can be found at any Microgaming casino, where you get a chance to play it for real money or in free mode.